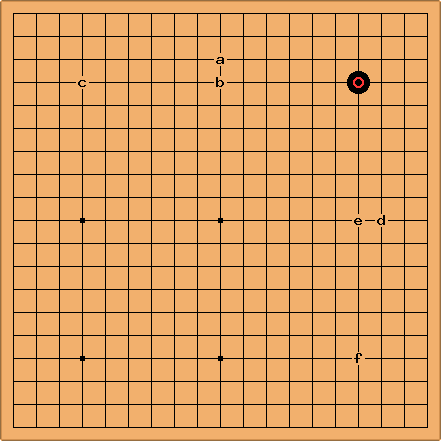 The 4-4 point is the corner star point (aka hoshi) on a 19x19 board, indicated by a bold dot. It has been far more popular as an opening in modern go than it was historically. Only in the twentieth century, and especially with the introduction of komi, did it begin to rival 3-4 point and 3-5 point openings as a common corner move. A stone on the 4-4 point strikes a balance between influencing the center and defending the corner. It isn't as secure, territorially, as any of the moves mentioned above (though the 3-5 is biased towards the side, rather than the corner). One could say the 4-4 point doesn't defend the corner at all, rather it defends the center and sides from the corner. To illustrate, an unsupported 3-3 invasion under the star point inevitably takes the corner, but gets sealed in on all sides. The common approaches (by white in the example) for the 4-4 point includes a, b, c and d. See 4-4 point josekis for more. Generally speaking, the 4-4 point does not aim at creating a secure corner territory. A second move (by black in the example) begins the enclosure process. However, even after a second move, the corner is open to invasion. These moves often arise in handicap games, though, or as a response to an approach. This corner is secure. is the "orthodox" method of preventing invasion after the 4-4 and 6-3 enclosure. However, it has taken Black three moves to perfect his corner, in comparison to a two-move enclosure based upon one of the other common openings. Despite the inferiority of the 4-4 in a territorial sense, the high position of the stone means that good extensions are immediately possible. Unlike the 3-4 point, there are no urgent moves in the corner. With as his opening move, Black would like to extend to both a or b and d or e; both are consistent with the center-oriented 4-4 point. The sanrensei opening involves playing , b, and c (Or e and f); the nirensei, and c or f. This sort of move, emphasizing influence and quick development, is more likely than an enclosure based on the 4-4 point.